9x12, ix + 180 pp. 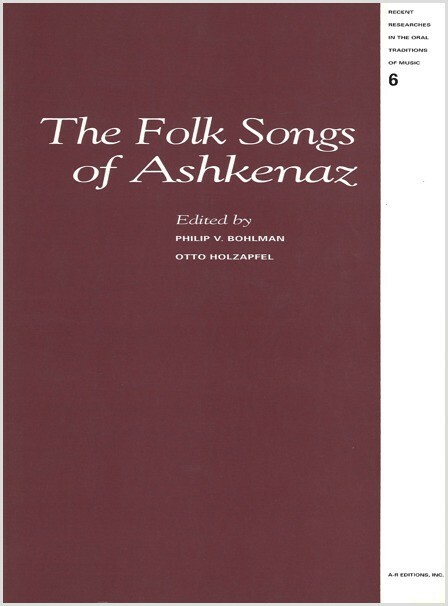 The Folk Songs of Ashkenaz dramatically transforms our understanding of music in the daily lives of the Jews of Central and Eastern Europe by documenting a five-century interaction between Jewish communities in which German, Yiddish, and their dialects were spoken as vernacular languages. Editors Philip Bohlman of the University of Chicago and Otto Holzapfel of the German Folk-Song Archive have searched through collections throughout Europe, North America, and Israel to gather a rich treasure of songs and their variants, which together reveal that contact between Jewish communities in the Ashkenazic diaspora was extensive and complex. Equally important is the documentation of exchange between Jewish communities and their non-Jewish neighbors, an exchange that clearly shows that the Jewish presence in European society before the Holocaust was greater than many have previously assumed. As revealed by songs such as the German ballad “The Count from Rome,” published here in a sixteenth-century printed version in Hebrew characters representing a Middle High German text, Jewish musicians, publishers, and consumers were actively involved in the formation of European culture already on the eve of modernity. This critical edition also contains songs that help us understand essential Jewish contributions to twentieth-century modernism, for example, through the stage of the Viennese Jewish cabaret. One of the most crucial contributions of The Folk Songs of Ashkenaz is the way in which the Jewish folk songs it contains help us to understand individual lives and the contributions of individuals to the historical moments in which they lived. With each song and variant, the editors have sought to uncover as much as possible about the singer and the cultural milieu in which she or he lived. But by no means is the volume primarily a reflection on the past, for the editors strive to connect the songs to living traditions, not least among them the revivals of Yiddish song and klezmer that emerged in the 1990s, again uniting Central and Eastern Europe, the two worlds joined by the folk songs of Ashkenaz. 1. "Die Jüdin" (DVldr 158)—"The Jewish Woman"
2. "Vater und Tochter" (DVldr 142)—"Father and Daughter"
3. "Zehn kleine Negerlein"—"Ten Little Blacks"
4. "Du hast gesagt" (Erk-Böhme 552)—"You Told Me"
5. "Jomi/Spinn, spinn/Mutter, ich will ein Ding han"—"Jomi/Spin, Spin/Mother, I Want Something"
7. "Das Scheinele"—"The Pretty One"
8. "Wie hoch ist der Himmel"—"How High the Sky Is"
9. "Yavo adir"—"May the Almighty Come"
10. "Die zwölf Zahlen" (Erk-Böhme 2130/34)—"The Twelve Numbers"
11. "Schlaf Kindchen schlaf"—"Sleep, Little Child, Sleep"
12. "Unmögliche Dinge" (Erk-Böhme 1090/94)—"Impossible Things"
13. "Graf von Rom" (DVldr 14)—"The Count of Rome"
14. "Michalke/Jan Hinnerk" (Erk-Böhme 1748a)—"Little Michael/Jan Hinnerk"
17. "Tzur mi-shelo"—"Rock of My Salvation"
19. "Ich ging in meinen Stall" (KiV)—"I Went into My Stall"
20. "Herr und Schildknecht" (DVldr 34)—"Knight and Squire"
21. "Schlangenköchin" (DVldr 79)—"The Snake-Cook"
22. Ich ging einmal spazieren" (Erk-Böhme 533)—"I Once Went for a Walk"
23. "Schneider, den mag ich nicht" (Erk-Böhme 842)—"I Wouldn't Like a Tailor"
24. "Frau von Weißenburg" (DVldr 30)—"The Woman from Weißenburg" and "Souterliedekens"
26. "Sajt gesunt, majne libe Eltern"—"Be Healthy, My Dear Parents"
27. "Die waiße Taibel"—"The White Dove"